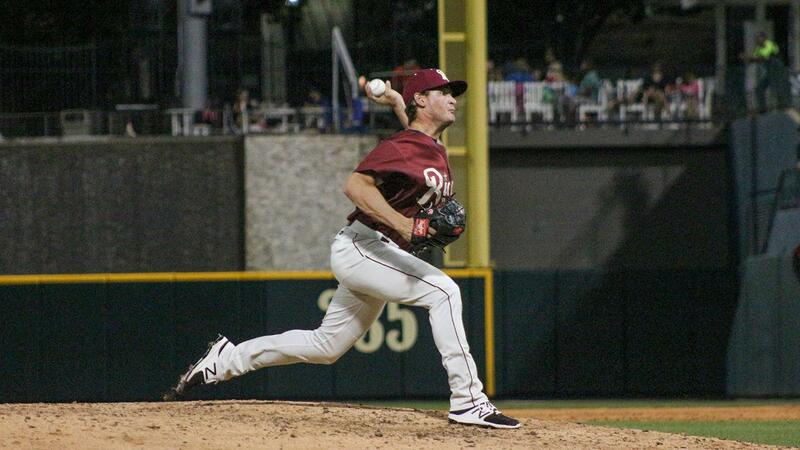 MIDLAND, Texas (April 12, 2019) - Behind a pair of big innings and clutch pitching down the stretch, the RoughRiders knocked off the Midland RockHounds 9-8 Friday night to win their fifth game in a row. * Leading 9-8 down the stretch, relievers Jake Lemoine and Locke St. John escaped jams in the eighth and ninth innings, respectively, to preserve the lead and close out the win. * The RoughRiders plated four runs in both the second and sixth innings to create a sizable cushion. * Preston Beck had an RBI double in each of the big frames for the Riders. * The RoughRiders have won five games in a row. * Eliezer Alvarez pushed his hitting streak to seven games and Michael De Leon ran his on-base streak to nine contests. The Frisco RoughRiders are the Double-A affiliate of the Texas Rangers and play their games at beautiful Dr Pepper Ballpark in Frisco, Texas. The team was founded in 2003 and has finished first among all Double-A franchises in attendance in each of the last 14 seasons (2005-2018). In August 2014, the RoughRiders were purchased by an ownership group led by Chuck Greenberg. Since then, the new ownership group, together with the City of Frisco, has spearheaded numerous major franchise enhancements, investing over $8 million in a wide array of facility upgrades and improvements, including a state-of-the-art HD video board, sound system, Bull Moose Saloon, InTouch Grille, Riders Outpost Team Store and the world's largest water feature in a sports facility, the massive Choctaw Lazy River. These enhancements earned the Riders and the City of Frisco Ballpark Digest's prestigious "Best Ballpark Renovation" award for xtwo consecutive years (2015 and 2016). More than 150 former RoughRiders players have gone on to play Major League Baseball, including All-Stars Chris Davis, Adrian Gonzalez, Ian Kinsler and Neftali Feliz, as well as current Rangers stars Elvis Andrus, Joey Gallo, Isiah Kiner-Falefa and Rougned Odor. For more information on the Frisco RoughRiders and Dr Pepper Ballpark, please visit RidersBaseball.com or contact Ryan Rouillard at RRouillard@RidersBaseball.com.